Will bulls find a little more gas in the tank to push stocks higher or will equities take a much-needed breather after the S&P 500’s 19% two-month rally? Either way, we’re still seeing strong moves in individual stocks, as highlighted by our list of must-see stock trades. Despite a consistent and dependable business, Home Depot (NYSE:HD) shares are under pressure after a disappointing earnings report. Shares were coiling nicely below $192.50, ready to launch higher had the report been more well-received. 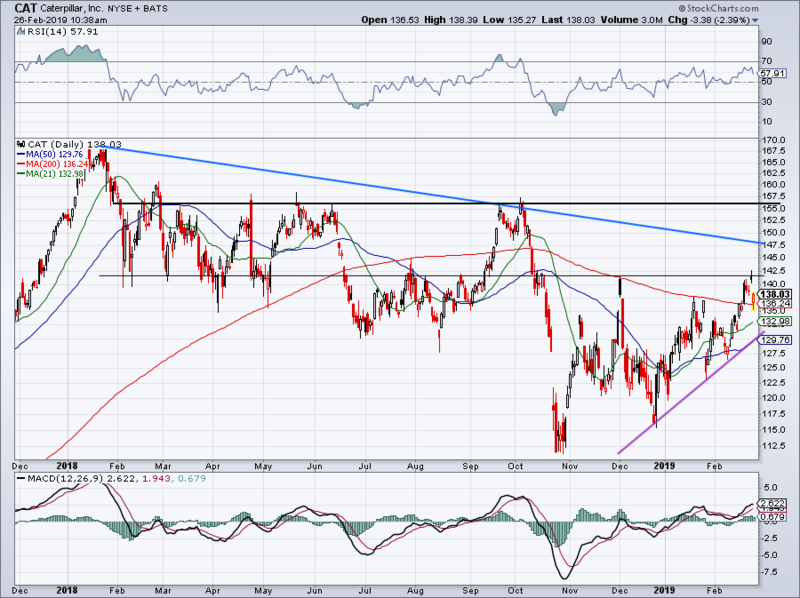 Instead, HD stock gapped down to $182.50 before reversing higher. Despite the rebound, shares are still below the 200-day and 21-day moving averages, as bulls look to see if they can erase the post-earnings deficit in the stock price. So what now? In a non-catastrophic way, HD stock is sort of in no man’s land right now. Below the 200-day and above the 50-day, the stock is clearly searching for direction. With that in mind, over the 200-day and $190, bulls can be long HD and look for more upside. Below the 50-day and the stock is likely heading for the $170-ish level, where buyers have traditionally stepped up to buy the name. A double-downgrade to sell from UBS has Caterpillar (NYSE:CAT) under pressure on Tuesday. While selling off, buyers were quick to step up and keep CAT over the 200-day. That’s encouraging action. Unfortunately though, it may take time for Caterpillar to push higher. While the economy is holding steady in the U.S., China is quite suspect at this time. Earnings last month were mixed at best and short of a trade deal between the two countries, CAT stock is lacking catalysts at the moment. The action here is encouraging though and so long as CAT is over its major moving averages and uptrend support (purple line), I’m not going to get overly bearish. Over $142 and CAT could make its way up to $155 resistance. We’re seeing a lot of similar action across the board, which is ill-received news to a particular stock and buyers bidding them up off the lows. It will be interesting to see if that post-earnings momentum can continue in a name like Shake Shack (NYSE:SHAK) or if the bears will undo the bulls’ effort. 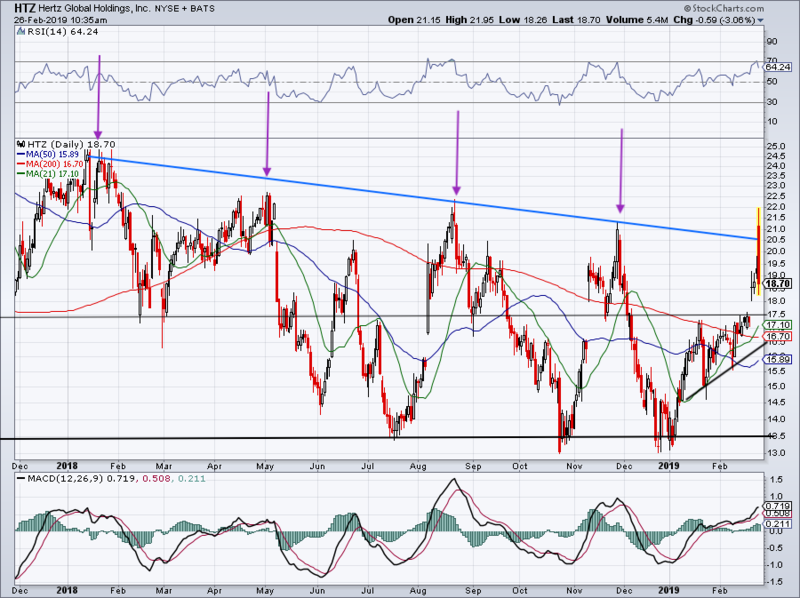 In the case of SHAK, the stock continues to hold up over short-term uptrend support (purple line) and prior downtrend resistance (blue line). Over the two-day high (call it $54), SHAK could make a run at the 200-day near $56. Above that and a run to $60+ is in the cards. On a pullback, I really want to see $46 hold. Near that area, it could be a great risk/reward long trade with the 50-day moving average, prior downtrend resistance and level support all in that area. Below is obviously bad news for the bulls. A series of lower highs has J.M. 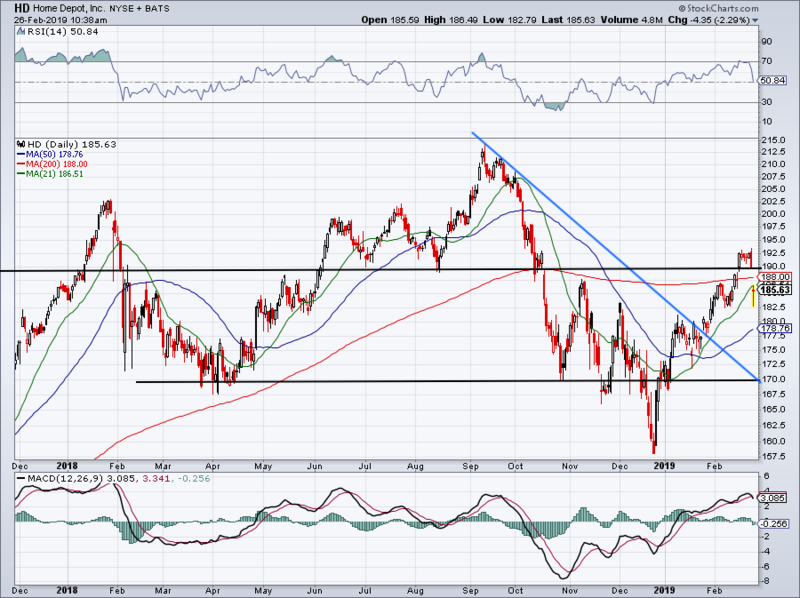 Smucker (NYSE:SJM) again testing the $100 level. Over the years, we have been buyers of this dividend stock at or a below $100 and riding the pops higher. However, that trade is happening with increasing frequency and that has me worried about the validity of this $100 level. Even with Tuesday’s spunky earnings rally, SJM is again logging a lower high. That may be premature, as the stock can continue higher in the ensuing days to negate the pattern, but as of now, it doesn’t look promising. Ordinarily I’m a buyer of SJM at $100, but I’m considering being a seller below $100. On a close below this mark, shorts can use the 50-day or 200-day as their stop-loss, whichever they’re most comfortable with. 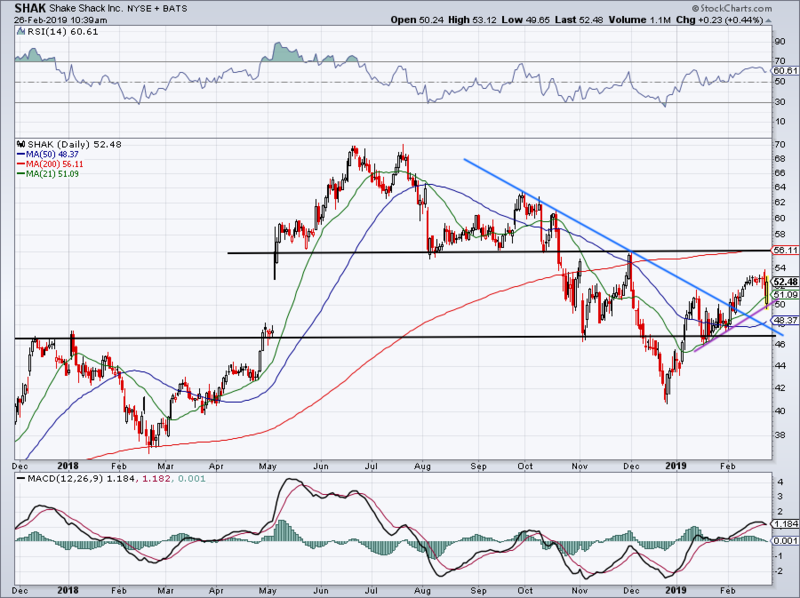 I’ve never been a big fan of Hertz (NYSE:HTZ), at least when it comes to the stock. Like SJM, HTZ has been putting in a series lower highs and watching Tuesday’s rally get crushed lower is very discouraging. 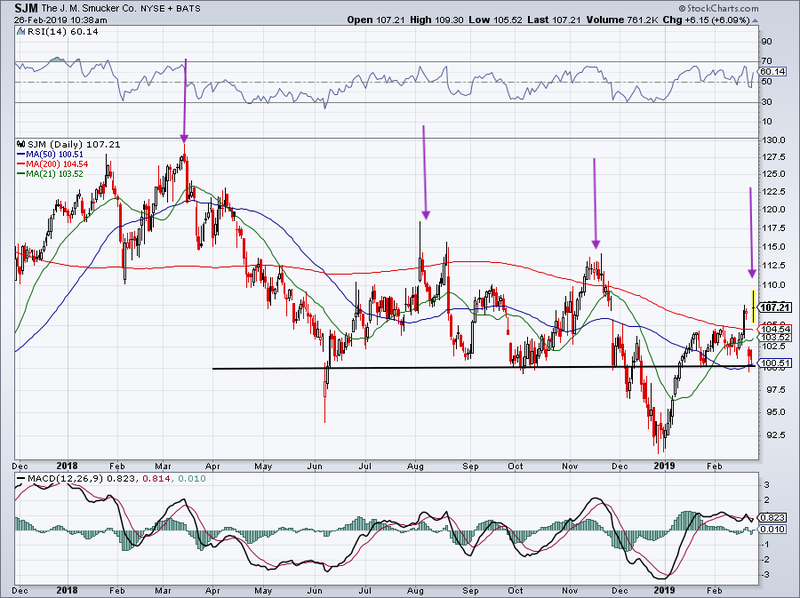 This may give shorts confidence to squeeze HTZ lower, at least down to about $17, where it starts to run into some support levels. Keep in mind, this stock has probed sub-$14 numerous times over the past 7 months. Near current levels, HTZ stock is too far off its highs to be a solid short trade, while still being too far from support to be a buy. A close near the lows may lead to more selling on Wednesday though. 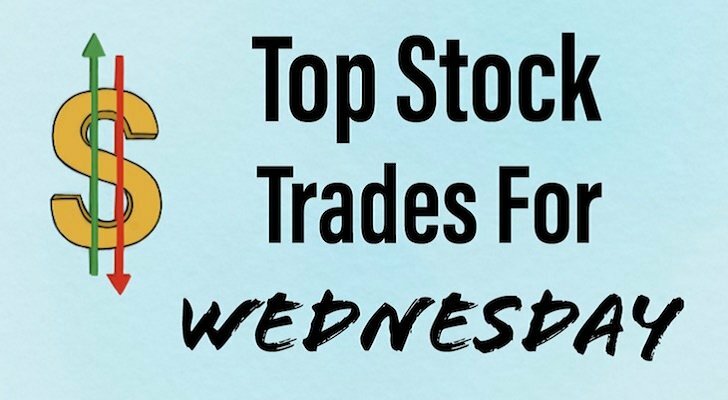 Article printed from InvestorPlace Media, https://investorplace.com/2019/02/5-must-see-stock-trades-for-wednesday-hd-cat-shak-htz/.